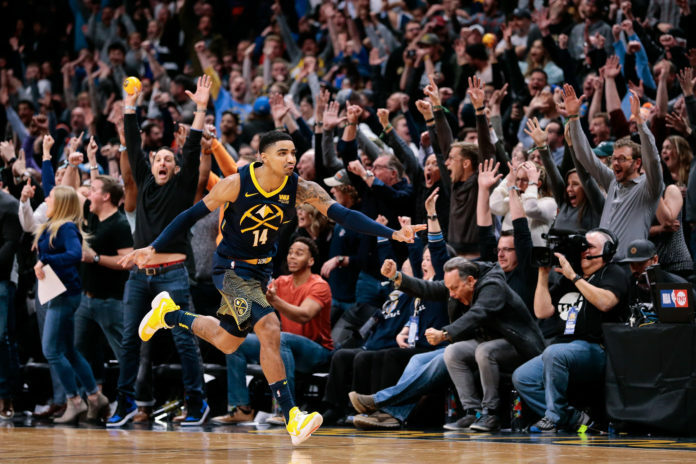 Gary Harris’ offensive improvement has been rapid and consistent. 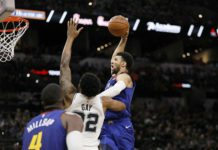 In his first year in the NBA, he shot terribly and was perceived as a player who may not be able to make it in the Association. He shot just 20.4 percent from three and 30.4 percent from the field in a very minuscule 13.1 minutes per game. Jump ahead to his sophomore campaign and suddenly Harris was hitting 15 percent more of his three-point attempts and played nearly 20 more minutes per game. He still was only shooting 35.4 percent from three and Harris made it a goal to come back an improved shooter. Then in his third year, Harris became one of the most lethal off-ball shooters in the entire NBA. He was hitting 42 percent of his three-point shots and his finishing at the rim took a drastic leap forward. Still, Harris wanted to be more than just a shooter. Finally, in his fourth NBA season, Harris is starting to scratch the surface of his true potential. No longer is he just a floor spacer who can finish at the rim. Suddenly Harris is emerging as one of the more efficient three-level scorers in the NBA and he is quickly learning how to be a lead guard as opposed to just an off-ball scorer. Harris’ improvement in every facet of his game has truly been a sight to behold, but what comes next could be even more impressive. Does Harris really have the potential to become one of the better overall offensive players in the NBA? When looking at the film, it is hard to rule it out. Yes, this is an article about how Harris is more than just a three-point threat, but what is important to keep in mind is how Harris’ three-point shooting is a catalyst for the rest of his offensive arsenal. So to fully explain where he has grown, it is important to know where his growth stems from. Harris’ ability to bend the floor and stretch defenses goes far beyond just standing in the corner looking to make himself available. Harris has much more dynamic shooting ability from three-point range than as a standstill shooter and his already large shooting repertoire continues to grow seemingly by the game. Just look at the video below. Yes, the shot is not incredibly tough in a vacuum, but this play is more about the confidence and shooting dynamism in Harris’ game. Normally a shooter in this situation would do one of three things: take the three immediately off the catch, drive to the rim, or continue swinging the ball. Harris elects to do none of those three options, but uses all of those potential outcomes as a means to create space for himself. Kyrie Irving is defending the play as if one of those three options will play out. Because of that, Irving gets into a position to either contest the shot or to recover on Harris driving to the rim. Because Harris knows what Irving is thinking, Harris is able to hesitate before pulling up from three using that extra half-second of patience to get Irving on his heels and unable to fully contest the three-point attempt. For most shooters, a rhythm is what allows them to stay hot and keep their mechanics controlled. For Harris, he does not need any of that as shown in the video above. Hitting threes out of rhythm is an incredibly difficult thing to do and it makes him a weapon from beyond the arc at all times. Harris’ pull-up three-point shooting goes beyond just using hesitation moves to create more space. Look below as Harris drives to the rim, gets walled off, and just decided to pull back out to the wing and hit a pull-up three-pointer in the face of Daniel Theis. This is just an absurd shot in every way you want to frame it. First off, Harris drives to the rim using only his off-hand and somehow still has the calmness of mind to keep his dribble alive even after being walled off once he got into the paint. Then, as he backs out to the three-point shooting line, Harris realizes he managed to create a mismatch with Theis electing to step out and continue defending him on the perimeter. Once Harris realizes that Theis followed him out to the three-point line, he used a crossover move to get into his gather and pulled up to nail a big three over the slower-footed Theis. Harris’ addition of shooting off the dribble — like he does above — has changed the way that defenses have to defend him. Harris was only in the 41st percentile as a shooter off the dribble in 2016-17, but he improved greatly off the bounce in 2017-18 and his numbers reflect that. Last year, Harris scored 0.95 points per possession when shooting off the dribble and that put him in the 80th percentile in the league and he did so on 117 more possessions. If Harris can continue to hit Steph Curry-esque pull-up shots like he does in the video above, the sky is the limit for Harris as a three-point shooter. Of course, Harris is also lethal as a catch and shoot three-point sniper. Nothing was a better example than his buzzer-beating three-pointer against the Oklahoma City Thunder from last year. This is just Harris being Harris. He is an absolute deadly shooter off the catch and it does not matter if he is on the move or shooting from a standstill. Harris’ three-point shooting is where the conversation about his skill set begins, but that does not mean it is where it ends. Harris’ weaponization of his three-point shot allows the rest of his game to shine even brighter. Where Harris has grown the most as a player is creating his own offense with the ball in his hands. Harris is rapidly becoming a three-level scorer who can get to the rim at will, find openings in the mid range, and — obviously — rain down mortar fire from beyond the three-point arc all on his own without the need of playmakers to create open looks for him. Look at Harris’ strength and instincts handling the ball below. He is dealing with pressure from the second that he receives the pass and has to use multiple crossovers and behind-the-back dribbles to get past the staunch defense of Jaylen Brown. After Brown meets Harris in the backcourt after he catches the pass, Harris realizes that he will be getting heavy pressure from Brown and that he will not get a screen from Mason Plumlee, who is deep underneath the rim. Harris doesn’t panic and uses a one crossover to get Brown leaning and another crossover to blow by him before finishing around Semi Ojeleye at the rim. Harris being able to use his handles, strength, and creativity to get to the rim is something that he did not have at an NBA-level when he first entered the league. Now, it is one of the things that makes him so impactful. Again, in the video below, Harris once again blows by Brown on his way to the rim, but this time Harris uses what opposing defenses view as his weakness to eventually score. Brown is attempting to force Harris to his left hand, so Harris obliges. The second that Brown jumps to Harris’ right to force him to his left hand is when Harris strikes. Look at how Harris uses a simple hang dribble to make it appear as if he is going to try and drive right. Once he does that, Brown jumps to Harris’ right side to slow him, but Harris uses another crossover the second that Brown makes his move and Harris blows by him leaving Brown trailing. Then, thanks to Jamal Murray’s arbitrary cut through the paint, Baynes is unable to rotate over to provide help defense and that is when Harris realizes he has a lane to the rim. Tatum tries to stunt down to slow Harris’ drive to the rim, but Harris shields the ball from him on his way to the basket. Harris then uses his left hand to finish at the rim because Marcus Smart only had time to rotate to the right side of his body. That is not just any drive to the rim. There are multiple high-level reads that Harris has to make on the fly while maintaining his dribble. Harris did not have that level of shot creation in his arsenal his first few years in the NBA, but now with those weapons at his disposal it is making it even more difficult to defend him. Harris has become a strong finisher at the rim, but where he has grown the most is as a scorer in the mid-range. This is one of the newest additions to Harris’ game, but he is already finding the soft zones in the mid-range to force defenses to stay honest with him. Even just a simple floater like the one Harris uses above is enough to create even more scoring opportunities. Baynes knows how strong Harris is at the rim so he falls a step back towards the rim in order to protect it so Harris does exactly what he is supposed to do; pull up in the soft spot of the defense and hit the mid-range shot. When Harris was just a three-point threat who can score at the rim, opposing defenses would drop their bigs back towards the rim so that they are available to contest his shots in the restricted zone. Now that Harris able to hit mid-range shots, opponents now have to send defenders further up the court to defend Harris. When other teams have to honor his mid-range scoring ability, it opens up the floor even more. Harris’ mid-range game is not just a fall-back option either. Look at the clip below where Harris gets just one step on Smart and uses his elite quickness to get off a great look at a mid-range jumper. Smart is one of the best defenders in the NBA, but Harris casually drives into him, uses his strength and quickness to create separation, and finishes the play with his feathery touch. These pull-up jumpers off the dribble in the midrange were rarely seen from Harris in his first three years in the NBA, but now they are becoming much more frequent as Harris’ role continues to be expanded more and more. Look at how comfortable Harris is creating with a live dribble and stepping back for a mid-range jumper against a mismatch. Harris sees that Baynes is backpedaling and knows that Baynes isn’t quick enough to recover and contest his shot so he just plants his lead foot as if he is driving to the rim to get Baynes leaning even further towards the rim and, without any hesitation, pulls up and buries the baseline jumper. 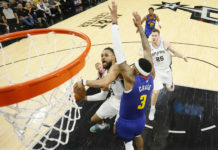 Because of the threat of Harris scoring from the midrange or three-point distance with his jump shot, his avenues to the rim have become much wider. Look below and Harris explodes to the rim because Theis has to step up to dissuade him from hitting another jumper. That is an absurdly difficult drive and finish. Harris uses the Faried screen to perfection, splits the pick and roll using a crossover from his off hand to his strong hand, and goes up and finishes the play with an authoritative slam. When skill, confidence, IQ, and god-given talent all converge together, plays like this appear. Harris was dead in the water with Brown inhaling him on the perimeter, but Harris’ confidence never wavered. He knows — thanks to his great basketball IQ — that Brown is trying to force him baseline into the help defense, but for this play to end in a bucket, the timing had to be perfect. Harris waits for Plumlee to jump out of the paint, bringing Baynes with him, and that creates a driving lane down the baseline. That is where Harris’ skill and god-given talent takes over and he finishes his absurd up-and-udner layup off of a eurostep. These plays show how far Harris has come as an offensive player. His play with a live dribble has drastically improved and it has led to him becoming a completely different kind of offensive monster mentally and physically. Harris is no longer just a three-point threat, but a full-fledged three-level scorer. Still, his offensive maturation doesn’t end there. The next frontier for Harris’ offensive production is developing the ability to create not just for himself, but for his teammates as well. Last year, Harris was in the 73rd percentile as a pick and roll ball handler and only had a turnover percentage of 9.3 percent with passes included according to Synergy. Even more impressive is that Harris had 300 total possessions in which he was the initiator in the pick and roll. Harris still has a long ways to go as a facilitator, but considering that 2017-18 was the first year that he operated as a initiator, all signs point to him being able to operate as a playmaker from time to time. For now, Harris has a few reads that he has grown comfortable making, but his facilitating is still inconsistent. Harris does a great job of finding shooters who are relocating to the right wing when he starts to drive into the paint, as shown below. This is his best read. Look above at Trey Lyles who sets a flare screen for Chandler before popping back out beyond the three-point line. Harris knows this action is taking place and patiently waits for Lyles to come open by using Plumlee as a screener twice. Harris’ patience is rewarded as Lyles comes open and Harris hits him with a pass that leads to a three. Harris’ instincts as a passer have been improving as well. He handled the ball much more in transition last year and was trusted to make the correct decisions on the fly. That trust was repaid as Harris graded out in the 93rd percentile as the ball handler in transition in 2017-18. 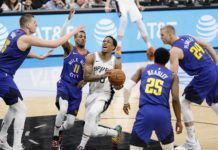 This is a simple read, but an important one being that the Nuggets should thrive in transition. Harris corrals the rebound and pushes the ball up the floor himself which forces the defense to react. Harris re-centers himself to the middle of the floor which forces Paul George to step up to slow him. Once Harris forces George to make a decision, the Nuggets immediately have an open Will Barton on the wing because Harris created a three-on-two transition opportunity on the left side of the floor by re-centering the ball. All that was left to do was make the simple pass that led to a wide-open three for Barton. It is no longer just simple reads that Harris is making as a facilitator either. In the play below, Smart tries to blow up the possession by drawing a charge on Harris, but instead of allowing that to happen, Harris creates an open three for Wilson Chandler. This assist is all based on one read. Harris is turns the corner on his way to the rim and quickly realizes that Smart is ball watching and left Chandler wide open. Harris drives into the outside shoulder of Smart to keep him from closing out on Chandler, avoids the charge, and delivers a perfect pass to Chandler for the open three. Those reads are slowly becoming instinctual for Harris. It takes years to learn how to create as a lead guard, and Harris is getting closer and closer to being able to not just score in a plethora of different ways, but also get his teammates involved like he does below with Plumlee. This play begins and ends with Harris. Without the threat of his jump shot from deep and the midrange, there is no way that Plumlee gets left as Baynes steps up to slow Harris’ path to the rim. Look at how Brown is forced to go over the screen to dissuade Harris from pulling up for three. Then, as he gets into the paint with Brown trailing him, Harris stops on a dime which forces Baynes to step up to him to keep him from taking an easy mid-range jumper. Because of Baynes stepping away from the rim, Plumlee slides in behind him for the wide open bucket. Harris is rapidly learning how to use his own gravity as a scorer to open up the floor for his teammates. If Harris is able to score at all three levels, create his own offense off the dribble, and facilitate for his teammates, he suddenly has the ingredients to grow into an elite guard in the National Basketball Association.